other groups differ on demographic matters; and the country’s geography and decades of conflict offer little prospect of a neutral, acceptable census. The center of the demographic dispute is the size of the Pashtun peoples of the south and east, who, on only sparing evidence, purport to be about 52% to 55% of the population and have so claimed since the 19th century. Other groups, however, disagree. They insist that the Pashtun are perhaps slightly more than 40% of the population, while disinterested assessments say Northerners constitute 45% to 50% of the population. The dispute is not merely a matter for demographers or even for the issue of moneys doled out from Kabul. It now centers on who will preside over Afghanistan – and indeed if there will be an Afghanistan as presently constituted. Mohammed Daoud’s reforms of the late 1970s led to violent opposition in most parts of the country and plunged the country into decades of intermittent warfare and foreign interventions from which the country has yet to recover. His successors fared little better and the various mujahideen groupings could not govern, which led to the Taliban government of the mid-1990s through 2001. There is wide agreement in the northern regions that Pashtun governments from Mohammed Daoud to Hamid Karzai have been incompetent, intrusive cabals that long misgoverned the country and are poised now to give it back to the Taliban in concert with foreigners from Pakistan and China. Northerners bitterly recall the Taliban as harsh southerners who slaughtered non-Pashtun people by the thousands. After fighting the Taliban to a standstill and ousting them in 2001, northerners felt their efforts guaranteed them predominance in the new government. They acceded to the accession of Karzai, the head of the (Pashtun) Popalzai tribe, to the presidency. This was done in part owing to US pressure and despite considerable support in the country for the Tajik statesman, Burhanuddin Rabbani, who also enjoyed support from regional powers that had supported the north well after the US washed its hands of the area. Over the past nine years, however, northerners have seen theirpoliticians pushed out of key ministries, especially the Ministry of Defense, which was once administered by the Tajik leader Mohammed Fahim. That portfolio is now in the hands of Abdul Wardak, a Pashtun who has used his office to reassert his people’s predominance in key military commands and simultaneously vitiated the militias of northern warlords. Northerners have been reduced to the rank-and-file of the Afghan National Army and ceremonial positions such as the country’s two vice presidencies. Outsiders have criticized the presidential and parliamentary elections as fraudulent. Karzai is widely believed to have interfered with local polling stations and given himself and his supporters wide victory margins. Northerners certainly agree but insist that outsiders miss an important aspect of Karzai’s fraudulence. He not only inflated the national support for himself and his supporters, he also suppressed evidence of non-Pashtun voters and their support for Tajik, Uzbek, and other peoples’ candidates. Pashtun politicians counter by insisting that it is the northerners who are tampering with the ballot box to overstate their numbers. Today, northerners contend the nation is on the brink of another act of legerdemain that will ensure Pashtun predominance – and misgovernment. The loya jirgas, which are romanticized in the West as a protodemocratic institution in colorful local dress, are simply another Pashtun ploy to ensure their dominance. Karzai’s peace council has been hand-selected to approve whatever settlement he presents them. Northerners sense that Karzai is about to betray them by settling with the Taliban, granting them large swathes of territory which northerners feel the Pashtun mullahs will one day use again to assert control across the country. 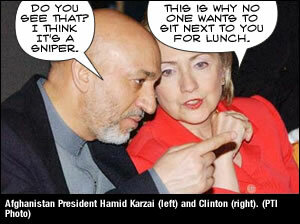 Further, Karzai is seen as collaborating with Pakistan to exploit Afghan resources in conjunction with China. Over the past few years, Generals Fahim and Rashid Dostum, leaders of Tajik and Uzbek forces, respectively, are said to have demobilized their forces and turned over their armor and artillery to the Afghan National Army (ANA) – as noted, a force largely purged of non-Pashtun commanders. Turning over heavy weapons is credible; full demobilization is not. There can be little doubt that these wily northerners, and other smaller ones, have retained patronage networks and forces in-being – lightly-armed, yet trained and loyal and angered by events in the south. The position and reliability of the ANA are unclear. Though chiefly commanded by Pashtuns now, northerners constitute at least 55% of the ANA’s officers and rank-and-file, with Tajiks greatly over-represented and judged to be the best fighters. Resentment toward Pashtun superiors – military and political – are almost certainly parts of soldierly conversations. The ANA’s battle record thus far is sparse, unremarkable, and unlikely to have instilled a super-ethnic identity. A break between northerners and Karzai would lead to serious conflicts within the ANA, including large-scale desertions and mutinies, particularly if called on to do so by Fahim and Dostum and the family of the late legendary mujahideen chieftain, Mohammed Ahmad Shah Massoud. Naturally, geopolitics and economics are at work as well. India seeks to counter growing Pakistani and Chinese influence in Afghanistan. Russia, too, is worried of growing Chinese influence in a region close to tsarist, Soviet and Russian interests. Iran plays a double game. It gives small amounts of arms to insurgents and trains them at an Islamic Revolutionary Guards Corps base in southeastern Iran. But this is a warning to the US should it, or Israel, attack Iranian nuclear facilities. Support to insurgents can go up markedly, perhaps to include Stinger-like missiles, and Quds Force guerrillas could be deployed against US troops to make supply lines even more parlous than they are today. Despite its limited support for the insurgency, Iran is deeply hostile to the Taliban, whom they recall as merciless Sunnis who slaughtered tens of thousands of Shi’ite Hazaras and who invaded an Iranian consulate and killed several diplomats. The three powerful regional powers also wish to share in the exploitation of Afghan resources and have a say in any pipeline that might be built there. India, Iran and Russia are pressing Karzai on neglected northern interests. Bagfuls of money have been known to bring nettlesome matters to a politician’s attention. They would support the north in the event of a break with the Pashtuns and are at least preparing to help rebuild separate military forces there. Each regional power has its intelligence people operating in the country, especially in the north. Northern concerns are being articulated to US officials by Tajiks, Uzbeks, Hazaras and other disgruntled non-Pashtuns who have been able to retain positions in the military and diplomatic service and also by those peoples. But US attention is mainly directed on counter-insurgency operations in the south and east and in seeking to begin a negotiated settlement. Despite its maladroitness over the past nine years, the US can join the regional powers in pressing Karzai on restoring positions in the army and state to northerners and in seating them prominently at any peace conference that might convene one day. Failure to do so may leave Karzai with a Taliban south and a secessionist north, leaving him with palaces in Kabul and restaurants abroad. A break between north and south could force the US to withdraw from the insurgent-wracked south and concentrate, politically and militarily, in the north. This would not be uniformly adverse: the US would find political development and military support far easier among the northerners than it is with the disparate and increasingly hostile Pashtun tribes in the south. In this regard, Washington and Kabul alike should pay greater attention to the ominous conflict with the north.